Sandiway Ski Club Tour organiser, Stephen Chivers, Dr Sam Mitchell (who got a mention on Tim’s video snow report) and Dr Ben Lipfriend attempted the Escapade on 30 January 2018. Unfortunately Col was closed so they did the Grand Fond twice to compensate (actually SC cocked up thinking he was going in to Orelle and went back in to VT to the disgust of his partners!). As they did not know the off piste route from Masse 2 to Plan De L’eau and sensibly did not try it on their own they used the 2014 route. They completed the route, but by the time they got back to Le Praz, Foret was closed – not realising it closed so early (second school boy error of the day). Was 16:25 but closes at 16:50 from 10 February 2018. Stephen attempted it on his own in 2014, but made two mistakes and by the time he got to Tovets it was just closed. In 2015 with two friends they made a critical wrong turning (not his mistake this time) and failed miserably. Still an achievement of someone who just turned 59 on Thursday, with over 60 miles skiing and having to ski down a mogul packed Combe Du Vallon with muscles completely burnt out. SC was not planning to try and ski it this year, but the conditions were perfect so had to try – he says it’s his last attempt… But even more of Sandiway Ski Club coming next year – someone needs to show them the route! For an easier 3 Valleys Day Challenge try the Selfies in a Day (note that Signal machine is at the top of Biollay and the Plan des Mains unit is at the top of the chair for 2018). 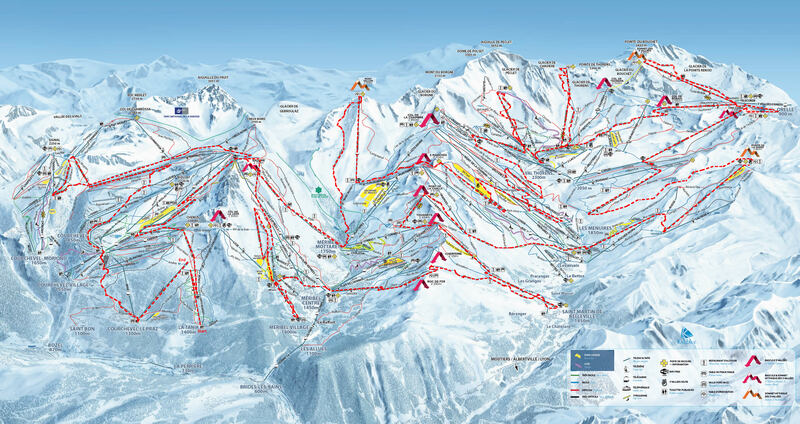 PDF list of lifts here for downloading to a smart phone – note Roc de Tougne chair not the drag now.